Made by Cing and published stateside by XSeed Games in 2009, Little King’s Story pleased many RPG and simulation fans on the Nintendo Wii. It was famous for its epic, lengthy boss battles and huge amount of things to do and places to explore. This week’s Famitsu magazine has revealed that the game might soon become a series, as another title is in development, this time for the PlayStation Vita. The full title is quite lengthy: The King, The Demon King, and The 7 Princesses: New Little King’s Story. The male lead will the be “little king” Korobo and the female lead will be an obnoxious brat of a princess named Apricot; these were also the main characters of the Wii game. It’s unclear at this time whether it’s an enhanced port or completely new game, though at the very least it will have a new story and Vita upgrades such as touch controls. Development and publishing is being handled jointly by Konami and Marvelous in Japan, as Cing has closed down in the days since the original game’s launch. 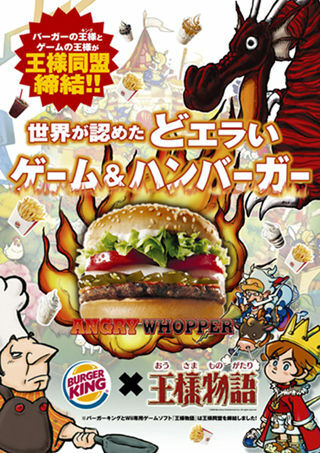 The New Little King’s Story is teaming up with Burger King for Japanese promos, which will work well for both groups. My island only just recently got its first Subway. Burger King would be a welcome addition. It is a wonderful restaurant.